This is a check list to be performed by yourself in about 1-2 hours depends of the size of the Data Center. We have a template with some questions to check easy by yourself, according best practices and standards. You need to have basic measurement equipments like: Thermal Camera, Airflow Meter, Thermometer, Hygrometer and Particle Counter for Dust measurement. 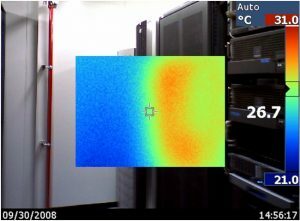 This is a professional inspection of the situation from the point of view of the Environmental Situation including Cooling, Dirtiness and Thermal Camera measurement, could be required some info about power consumption per rack, line or UPS provided by the client. You will need about 1 day to measure all the racks with IR Thermometer, Some points of heat humidity, velocity of the grills and Fill our Excel File. Final Report by ATD and ATS with Conclusions and Advise according the best practices and standards ISO 14644 and ASHRAE TC 9.9 about the actual situation and how to increment performance, security, energy saving, etc. Prices depends of the size of the Data Center, then need a plant view and total sqm to quote, i.e. until 20 racks about 2750 €. This is a big picture of the situation including Electrical and Cooling System, Redundancy and Environmental Situation. Deep inspection according ISO 14644, ASHRAE TC 9.9 and UPTIME INSTITUTE, performed and signed by ATD (Acredited Tier Designed) and ATS (Acredited Tier Specialist) by UPTIME INSTITUTE. Final Report with Conclusions and Advise about the actual situation (Tier topology) and how to increase performance, security, energy savings, etc. Prices depends of the size of the Data Center, then need a plant view and total sqm to quote.